For other uses, see Wormhole (disambiguation). "Einstein-Rosen Bridge" redirects here. For the EP by Venetian Snares, see Einstein-Rosen Bridge (EP). In 1928, Hermann Weyl proposed a wormhole hypothesis of matter in connection with mass analysis of electromagnetic field energy; however, he did not use the term "wormhole" (he spoke of "one-dimensional tubes" instead). This analysis forces one to consider situations ... where there is a net flux of lines of force, through what topologists would call "a handle" of the multiply-connected space, and what physicists might perhaps be excused for more vividly terming a "wormhole". If a Minkowski spacetime contains a compact region Ω, and if the topology of Ω is of the form Ω ~ R × Σ, where Σ is a three-manifold of the nontrivial topology, whose boundary has topology of the form ∂Σ ~ S2, and if, furthermore, the hypersurfaces Σ are all spacelike, then the region Ω contains a quasipermanent intrauniverse wormhole. a region of spacetime containing a "world tube" (the time evolution of a closed surface) that cannot be continuously deformed (shrunk) to a world line (the time evolution of a point). The equations of the theory of general relativity have valid solutions that contain wormholes. The first type of wormhole solution discovered was the Schwarzschild wormhole, which would be present in the Schwarzschild metric describing an eternal black hole, but it was found that it would collapse too quickly for anything to cross from one end to the other. Wormholes that could be crossed in both directions, known as traversable wormholes, would only be possible if exotic matter with negative energy density could be used to stabilize them. Schwarzschild wormholes, also known as Einstein–Rosen bridges (named after Albert Einstein and Nathan Rosen), are connections between areas of space that can be modeled as vacuum solutions to the Einstein field equations, and that are now understood to be intrinsic parts of the maximally extended version of the Schwarzschild metric describing an eternal black hole with no charge and no rotation. Here, "maximally extended" refers to the idea that the spacetime should not have any "edges": it should be possible to continue this path arbitrarily far into the particle's future or past for any possible trajectory of a free-falling particle (following a geodesic in the spacetime). In order to satisfy this requirement, it turns out that in addition to the black hole interior region that particles enter when they fall through the event horizon from the outside, there must be a separate white hole interior region that allows us to extrapolate the trajectories of particles that an outside observer sees rising up away from the event horizon. And just as there are two separate interior regions of the maximally extended spacetime, there are also two separate exterior regions, sometimes called two different "universes", with the second universe allowing us to extrapolate some possible particle trajectories in the two interior regions. This means that the interior black hole region can contain a mix of particles that fell in from either universe (and thus an observer who fell in from one universe might be able to see light that fell in from the other one), and likewise particles from the interior white hole region can escape into either universe. All four regions can be seen in a spacetime diagram that uses Kruskal–Szekeres coordinates. In this spacetime, it is possible to come up with coordinate systems such that if a hypersurface of constant time (a set of points that all have the same time coordinate, such that every point on the surface has a space-like separation, giving what is called a 'space-like surface') is picked and an "embedding diagram" drawn depicting the curvature of space at that time, the embedding diagram will look like a tube connecting the two exterior regions, known as an "Einstein–Rosen bridge". Note that the Schwarzschild metric describes an idealized black hole that exists eternally from the perspective of external observers; a more realistic black hole that forms at some particular time from a collapsing star would require a different metric. When the infalling stellar matter is added to a diagram of a black hole's history, it removes the part of the diagram corresponding to the white hole interior region, along with the part of the diagram corresponding to the other universe. The Einstein–Rosen bridge was discovered by Ludwig Flamm in 1916, a few months after Schwarzschild published his solution, and was rediscovered by Albert Einstein and his colleague Nathan Rosen, who published their result in 1935. However, in 1962, John Archibald Wheeler and Robert W. Fuller published a paper showing that this type of wormhole is unstable if it connects two parts of the same universe, and that it will pinch off too quickly for light (or any particle moving slower than light) that falls in from one exterior region to make it to the other exterior region. According to general relativity, the gravitational collapse of a sufficiently compact mass forms a singular Schwarzschild black hole. In the Einstein–Cartan–Sciama–Kibble theory of gravity, however, it forms a regular Einstein–Rosen bridge. This theory extends general relativity by removing a constraint of the symmetry of the affine connection and regarding its antisymmetric part, the torsion tensor, as a dynamical variable. Torsion naturally accounts for the quantum-mechanical, intrinsic angular momentum (spin) of matter. The minimal coupling between torsion and Dirac spinors generates a repulsive spin–spin interaction that is significant in fermionic matter at extremely high densities. Such an interaction prevents the formation of a gravitational singularity. [clarification needed] Instead, the collapsing matter reaches an enormous but finite density and rebounds, forming the other side of the bridge. Although Schwarzschild wormholes are not traversable in both directions, their existence inspired Kip Thorne to imagine traversable wormholes created by holding the "throat" of a Schwarzschild wormhole open with exotic matter (material that has negative mass/energy). Other non-traversable wormholes include Lorentzian wormholes (first proposed by John Archibald Wheeler in 1957), wormholes creating a spacetime foam in a general relativistic spacetime manifold depicted by a Lorentzian manifold, and Euclidean wormholes (named after Euclidean manifold, a structure of Riemannian manifold). The Casimir effect shows that quantum field theory allows the energy density in certain regions of space to be negative relative to the ordinary matter vacuum energy, and it has been shown theoretically that quantum field theory allows states where energy can be arbitrarily negative at a given point. Many physicists, such as Stephen Hawking, Kip Thorne, and others, argue that such effects might make it possible to stabilize a traversable wormhole. Physicists have not found any natural process that would be predicted to form a wormhole naturally in the context of general relativity, although the quantum foam hypothesis is sometimes used to suggest that tiny wormholes might appear and disappear spontaneously at the Planck scale,:494–496 and stable versions of such wormholes have been suggested as dark matter candidates. It has also been proposed that, if a tiny wormhole held open by a negative mass cosmic string had appeared around the time of the Big Bang, it could have been inflated to macroscopic size by cosmic inflation. Lorentzian traversable wormholes would allow travel in both directions from one part of the universe to another part of that same universe very quickly or would allow travel from one universe to another. The possibility of traversable wormholes in general relativity was first demonstrated in a 1973 paper by Homer Ellis and independently in a 1973 paper by K. A. Bronnikov. Ellis analyzed the topology and the geodesics of the Ellis drainhole, showing it to be geodesically complete, horizonless, singularity-free, and fully traversable in both directions. The drainhole is a solution manifold of Einstein's field equations for a vacuum space-time, modified by inclusion of a scalar field minimally coupled to the Ricci tensor with antiorthodox polarity (negative instead of positive). (Ellis specifically rejected referring to the scalar field as 'exotic' because of the antiorthodox coupling, finding arguments for doing so unpersuasive.) The solution depends on two parameters: m, which fixes the strength of its gravitational field, and n, which determines the curvature of its spatial cross sections. When m is set equal to 0, the drainhole's gravitational field vanishes. What is left is the Ellis wormhole, a nongravitating, purely geometric, traversable wormhole. Kip Thorne and his graduate student Mike Morris, unaware of the 1973 papers by Ellis and Bronnikov, manufactured, and in 1988 published, a duplicate of the Ellis wormhole for use as a tool for teaching general relativity. For this reason, the type of traversable wormhole they proposed, held open by a spherical shell of exotic matter, was from 1988 to 2015 referred to in the literature as a Morris–Thorne wormhole. 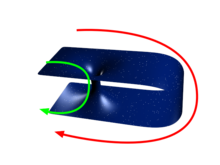 Later, other types of traversable wormholes were discovered as allowable solutions to the equations of general relativity, including a variety analyzed in a 1989 paper by Matt Visser, in which a path through the wormhole can be made where the traversing path does not pass through a region of exotic matter. However, in the pure Gauss–Bonnet gravity (a modification to general relativity involving extra spatial dimensions which is sometimes studied in the context of brane cosmology) exotic matter is not needed in order for wormholes to exist—they can exist even with no matter. A type held open by negative mass cosmic strings was put forth by Visser in collaboration with Cramer et al., in which it was proposed that such wormholes could have been naturally created in the early universe. To see why exotic matter is required, consider an incoming light front traveling along geodesics, which then crosses the wormhole and re-expands on the other side. The expansion goes from negative to positive. As the wormhole neck is of finite size, we would not expect caustics to develop, at least within the vicinity of the neck. According to the optical Raychaudhuri's theorem, this requires a violation of the averaged null energy condition. Quantum effects such as the Casimir effect cannot violate the averaged null energy condition in any neighborhood of space with zero curvature, but calculations in semiclassical gravity suggest that quantum effects may be able to violate this condition in curved spacetime. Although it was hoped recently that quantum effects could not violate an achronal version of the averaged null energy condition, violations have nevertheless been found, so it remains an open possibility that quantum effects might be used to support a wormhole. In some hypotheses where general relativity is modified, it is possible to have a wormhole that does not collapse without having to resort to exotic matter. For example, this is possible with R2 gravity, a form of f(R) gravity. The impossibility of faster-than-light relative speed only applies locally. Wormholes might allow effective superluminal (faster-than-light) travel by ensuring that the speed of light is not exceeded locally at any time. While traveling through a wormhole, subluminal (slower-than-light) speeds are used. If two points are connected by a wormhole whose length is shorter than the distance between them outside the wormhole, the time taken to traverse it could be less than the time it would take a light beam to make the journey if it took a path through the space outside the wormhole. However, a light beam traveling through the same wormhole would beat the traveler. If traversable wormholes exist, they could allow time travel. 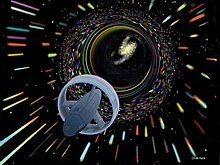 A proposed time-travel machine using a traversable wormhole would hypothetically work in the following way: One end of the wormhole is accelerated to some significant fraction of the speed of light, perhaps with some advanced propulsion system, and then brought back to the point of origin. Alternatively, another way is to take one entrance of the wormhole and move it to within the gravitational field of an object that has higher gravity than the other entrance, and then return it to a position near the other entrance. For both of these methods, time dilation causes the end of the wormhole that has been moved to have aged less, or become "younger", than the stationary end as seen by an external observer; however, time connects differently through the wormhole than outside it, so that synchronized clocks at either end of the wormhole will always remain synchronized as seen by an observer passing through the wormhole, no matter how the two ends move around. :502 This means that an observer entering the "younger" end would exit the "older" end at a time when it was the same age as the "younger" end, effectively going back in time as seen by an observer from the outside. One significant limitation of such a time machine is that it is only possible to go as far back in time as the initial creation of the machine;:503 It is more of a path through time rather than it is a device that itself moves through time, and it would not allow the technology itself to be moved backward in time. In 1993, Matt Visser argued that the two mouths of a wormhole with such an induced clock difference could not be brought together without inducing quantum field and gravitational effects that would either make the wormhole collapse or the two mouths repel each other, or otherwise prevent information from passing through the wormhole. Because of this, the two mouths could not be brought close enough for causality violation to take place. However, in a 1997 paper, Visser hypothesized that a complex "Roman ring" (named after Tom Roman) configuration of an N number of wormholes arranged in a symmetric polygon could still act as a time machine, although he concludes that this is more likely a flaw in classical quantum gravity theory rather than proof that causality violation is possible. A possible resolution to the paradoxes resulting from wormhole-enabled time travel rests on the many-worlds interpretation of quantum mechanics. In 1991 David Deutsch showed that quantum theory is fully consistent (in the sense that the so-called density matrix can be made free of discontinuities) in spacetimes with closed timelike curves. However, later it was shown that such model of closed timelike curve can have internal inconsistencies as it will lead to strange phenomena like distinguishing non-orthogonal quantum states and distinguishing proper and improper mixture. Accordingly, the destructive positive feedback loop of virtual particles circulating through a wormhole time machine, a result indicated by semi-classical calculations, is averted. A particle returning from the future does not return to its universe of origination but to a parallel universe. This suggests that a wormhole time machine with an exceedingly short time jump is a theoretical bridge between contemporaneous parallel universes. Because a wormhole time-machine introduces a type of nonlinearity into quantum theory, this sort of communication between parallel universes is consistent with Joseph Polchinski's proposal of an Everett phone (named after Hugh Everett) in Steven Weinberg's formulation of nonlinear quantum mechanics. The possibility of communication between parallel universes has been dubbed interuniversal travel. first presented by Ellis (see Ellis wormhole) as a special case of the Ellis drainhole. The original Einstein–Rosen bridge was described in an article published in July 1935.
vanishes. We call such a connection between the two sheets a "bridge". —  A. Einstein, N. Rosen, "The Particle Problem in the General Theory of Relativity"
Wormholes are a common element in science fiction because they allow interstellar, intergalactic, and sometimes even interuniversal travel within human lifetime scales. In fiction, wormholes have also served as a method for time travel. The movie Interstellar uses the concept of a wormhole to allow its protagonist to travel to another galaxy. The Einstein - Rosen bridge is also mentioned in Thor: Ragnarok. ^ "Focus: Wormhole Construction: Proceed with Caution". Physics. 2. 1998-08-03 – via American Physical Society. ^ Weyl, H. (1921). "Feld und Materie". Annalen der Physik. 65 (14): 541–563. Bibcode:1921AnP...370..541W. doi:10.1002/andp.19213701405. ^ Scholz, Erhard, ed. (2001). Hermann Weyl's Raum – Zeit – Materie and a General Introduction to His Scientific Work. Oberwolfach Seminars. 30. Springer. p. 199. ISBN 9783764364762. ^ a b "Hermann Weyl": entry in the Stanford Encyclopedia of Philosophy. ^ Misner, C. W.; Wheeler, J. A. (1957). "Classical physics as geometry". Ann. Phys. 2 (6): 525. Bibcode:1957AnPhy...2..525M. doi:10.1016/0003-4916(57)90049-0. ^ a b Vladimir Dobrev (ed. ), Lie Theory and Its Applications in Physics: Varna, Bulgaria, June 2015, Springer, 2016, p. 246. ^ Hockney, Mike (2015). Black Holes are Souls. Hyperreality Books. ^ a b A. Einstein and N. Rosen, "The Particle Problem in the General Theory of Relativity," Phys. Rev. 48(73) (1935). ^ "Collapse to a Black Hole". Casa.colorado.edu. 2010-10-03. Retrieved 2010-11-11. This tertiary source reuses information from other sources but does not name them. ^ Lindley, David (Mar 25, 2005). "Focus: The Birth of Wormholes". Physics. American Physical Society. Retrieved 20 February 2016. ^ R. W. Fuller and J. A. Wheeler, "Causality and Multiply-Connected Space-Time," Phys. Rev. 128(919) (1962). ^ Poplawski, Nikodem J. (2010). "Cosmology with torsion: An alternative to cosmic inflation". Phys. Lett. B. 694 (3): 181–185. arXiv:1007.0587. Bibcode:2010PhLB..694..181P. doi:10.1016/j.physletb.2010.09.056. ^ Eduard Prugovecki, Quantum Geometry: A Framework for Quantum General Relativity, Springer, 2013, p. 412. ^ Everett, Allen; Roman, Thomas (2012). Time Travel and Warp Drives. University of Chicago Press. p. 167. ISBN 978-0-226-22498-5. ^ "Space and Time Warps". Hawking.org.uk. Retrieved 2010-11-11. ^ a b c Morris, Michael; Thorne, Kip; Yurtsever, Ulvi (1988). "Wormholes, Time Machines, and the Weak Energy Condition" (PDF). Physical Review Letters. 61 (13): 1446–1449. Bibcode:1988PhRvL..61.1446M. doi:10.1103/PhysRevLett.61.1446. PMID 10038800. ^ Sopova; Ford (2002). "The Energy Density in the Casimir Effect". Physical Review D. 66 (4): 045026. arXiv:quant-ph/0204125. Bibcode:2002PhRvD..66d5026S. CiteSeerX 10.1.1.251.7471. doi:10.1103/PhysRevD.66.045026. ^ Ford; Roman (1995). "Averaged Energy Conditions and Quantum Inequalities". Physical Review D. 51 (8): 4277–4286. arXiv:gr-qc/9410043. Bibcode:1995PhRvD..51.4277F. doi:10.1103/PhysRevD.51.4277. ^ Olum (1998). "Superluminal travel requires negative energies". Physical Review Letters. 81 (17): 3567–3570. arXiv:gr-qc/9805003. Bibcode:1998PhRvL..81.3567O. doi:10.1103/PhysRevLett.81.3567. ^ "Newfound Wormhole Allows Information to Escape Black Holes". Quanta Magazine. ^ "Traversable wormhole, a key to quantum teleportation - Resonance Science Foundation". 1 November 2017. ^ Ian H., Redmount; Wai-Mo Suen (1994). "Quantum Dynamics of Lorentzian Spacetime Foam". Physical Review D. 49 (10): 5199–5210. arXiv:gr-qc/9309017. Bibcode:1994PhRvD..49.5199R. doi:10.1103/PhysRevD.49.5199. ^ Kirillov, A. A.; P. Savelova, E. (2008). "Dark Matter from a gas of wormholes". Physics Letters B. 660 (3): 93–99. arXiv:0707.1081. Bibcode:2008PhLB..660...93K. doi:10.1016/j.physletb.2007.12.034. ^ Rodrigo, Enrico (2009). "Denouement of a Wormhole-Brane Encounter". International Journal of Modern Physics D. 18 (12): 1809–1819. arXiv:0908.2651. Bibcode:2009IJMPD..18.1809R. doi:10.1142/S0218271809015333. ^ a b John G. Cramer; Robert L. Forward; Michael S. Morris; Matt Visser; Gregory Benford & Geoffrey A. Landis (1995). "Natural Wormholes as Gravitational Lenses" (Submitted manuscript). Physical Review D. 51 (6): 3117–3120. arXiv:astro-ph/9409051. Bibcode:1995PhRvD..51.3117C. doi:10.1103/PhysRevD.51.3117. ^ Other computer-rendered images and animations of traversable wormholes can be seen on this page by the creator of the image in the article, and this page has additional renderings. ^ H. G. Ellis (1973). "Ether flow through a drainhole: A particle model in general relativity". Journal of Mathematical Physics. 14 (1): 104–118. Bibcode:1973JMP....14..104E. doi:10.1063/1.1666161. ^ K. A. Bronnikov (1973). "Scalar-tensor theory and scalar charge". Acta Physica Polonica. B4: 251–266. ^ Elias Gravanis; Steven Willison (2007). "'Mass without mass' from thin shells in Gauss-Bonnet gravity". Phys. Rev. D. 75 (8): 084025. arXiv:gr-qc/0701152. Bibcode:2007PhRvD..75h4025G. doi:10.1103/PhysRevD.75.084025. ^ Fewster, Christopher J.; Ken D. Olum; Michael J. Pfenning (2007). "Averaged null energy condition in spacetimes with boundaries". Physical Review D. 75 (2): 025007. arXiv:gr-qc/0609007. Bibcode:2007PhRvD..75b5007F. doi:10.1103/PhysRevD.75.025007. ^ Visser, Matt (1996). "Gravitational vacuum polarization. II. Energy conditions in the Boulware vacuum". Physical Review D. 54 (8): 5116–5122. arXiv:gr-qc/9604008. Bibcode:1996PhRvD..54.5116V. doi:10.1103/PhysRevD.54.5116. ^ Graham, Noah; Ken D. Olum (2007). "Achronal averaged null energy condition". Physical Review D. 76 (6): 064001. arXiv:0705.3193. Bibcode:2007PhRvD..76f4001G. doi:10.1103/PhysRevD.76.064001. ^ Urban, Douglas; Ken D. Olum (2010). "Spacetime averaged null energy condition". Physical Review D. 81 (6): 124004. arXiv:1002.4689. Bibcode:2010PhRvD..81l4004U. doi:10.1103/PhysRevD.81.124004. ^ Duplessis, Francis; Easson, Damien A. (2015). "Exotica ex nihilo: Traversable wormholes & non-singular black holes from the vacuum of quadratic gravity". Physical Review D. 92 (4): 043516. arXiv:1506.00988. Bibcode:2015PhRvD..92d3516D. doi:10.1103/PhysRevD.92.043516. ^ Susskind, Leonard (2005). "Wormholes and Time Travel? Not Likely". arXiv:gr-qc/0503097. ^ Everett, Allen; Roman, Thomas (2012). Time Travel and Warp Drives. University of Chicago Press. p. 135. ISBN 978-0-226-22498-5. ^ Visser, Matt; Sayan Kar; Naresh Dadhich (2003). "Traversable wormholes with arbitrarily small energy condition violations" (Submitted manuscript). Physical Review Letters. 90 (20): 201102.1–201102.4. arXiv:gr-qc/0301003. Bibcode:2003PhRvL..90t1102V. doi:10.1103/PhysRevLett.90.201102. PMID 12785880. ^ Visser, Matt (2002). "The quantum physics of chronology protection". arXiv:gr-qc/0204022. ^ Deutsch, David (1991). "Quantum Mechanics Near Closed Timelike Lines". Physical Review D. 44 (10): 3197. Bibcode:1991PhRvD..44.3197D. doi:10.1103/PhysRevD.44.3197. ^ Brun; et al. (2009). "Localized Closed Timelike Curves Can Perfectly Distinguish Quantum States". Physical Review Letters. 102 (21): 210402. arXiv:0811.1209. Bibcode:2009PhRvL.102u0402B. doi:10.1103/PhysRevLett.102.210402. PMID 19519086. ^ Pati; Chakrabarty; Agrawal (2011). "Purification of mixed states with closed timelike curve is not possible". Physical Review A. 84 (6): 062325. arXiv:1003.4221. Bibcode:2011PhRvA..84f2325P. doi:10.1103/PhysRevA.84.062325. ^ Rodrigo, Enrico (2010). The Physics of Stargates. Eridanus Press. p. 281. ISBN 978-0-9841500-0-7. ^ Polchinski, Joseph (1991). "Weinberg's Nonlinear quantum Mechanics and the Einstein-Podolsky-Rosen Paradox". Physical Review Letters. 66 (4): 397–400. Bibcode:1991PhRvL..66..397P. doi:10.1103/PhysRevLett.66.397. PMID 10043797. ^ Enrico Rodrigo, The Physics of Stargates: Parallel Universes, Time Travel, and the Enigma of Wormhole Physics, Eridanus Press, 2010, p. 281. ^ Samuel Walker, "Inter-universal travel: I wouldn't start from here, New Scientist (1 February 2017). ^ Raine, Derek; Thomas, Edwin (2009). Black Holes: An Introduction (2nd ed.). Imperial College Press. p. 143. doi:10.1142/p637. ISBN 978-1-84816-383-6. ^ Einstein, A.; Rosen, N. (1 July 1935). "The Particle Problem in the General Theory of Relativity". Physical Review. 48 (1): 73–77. Bibcode:1935PhRv...48...73E. doi:10.1103/PhysRev.48.73. ^ "Leonard Susskind | 'ER = EPR' or 'What's Behind the Horizons of Black Holes?'". ^ "Magnetic wormhole connecting two regions of space created for the first time". ^ "Magnetic wormhole created for first time". DeBenedictis, Andrew & Das, A. (2001). "On a General Class of Wormhole Geometries". Classical and Quantum Gravity. 18 (7): 1187–1204. arXiv:gr-qc/0009072. Bibcode:2001CQGra..18.1187D. CiteSeerX 10.1.1.339.8662. doi:10.1088/0264-9381/18/7/304. Dzhunushaliev, Vladimir (2002). "Strings in the Einstein's paradigm of matter". Classical and Quantum Gravity. 19 (19): 4817–4824. arXiv:gr-qc/0205055. Bibcode:2002CQGra..19.4817D. CiteSeerX 10.1.1.339.1518. doi:10.1088/0264-9381/19/19/302. Einstein, Albert & Rosen, Nathan (1935). "The Particle Problem in the General Theory of Relativity". Physical Review. 48: 73. Bibcode:1935PhRv...48...73E. doi:10.1103/PhysRev.48.73. Fuller, Robert W. & Wheeler, John A. (1962). "Causality and Multiply-Connected Space-Time". Physical Review. 128 (2): 919. Bibcode:1962PhRv..128..919F. doi:10.1103/PhysRev.128.919. Garattini, Remo (2004). "How Spacetime Foam modifies the brick wall". Modern Physics Letters A. 19 (36): 2673–2682. arXiv:gr-qc/0409015. Bibcode:2004MPLA...19.2673G. doi:10.1142/S0217732304015658. González-Díaz, Pedro F. (1998). "Quantum time machine". Physical Review D. 58 (12): 124011. arXiv:gr-qc/9712033. Bibcode:1998PhRvD..58l4011G. doi:10.1103/PhysRevD.58.124011. hdl:10261/100644. González-Díaz, Pedro F. (1996). "Ringholes and closed timelike curves". Physical Review D. 54 (10): 6122–6131. arXiv:gr-qc/9608059. Bibcode:1996PhRvD..54.6122G. doi:10.1103/PhysRevD.54.6122. Khatsymosky, Vladimir M. (1997). "Towards possibility of self-maintained vacuum traversable wormhole". Physics Letters B. 399 (3–4): 215–222. arXiv:gr-qc/9612013. Bibcode:1997PhLB..399..215K. doi:10.1016/S0370-2693(97)00290-6. Krasnikov, Serguei (2006). "Counter example to a quantum inequality". Gravity and Cosmology. 46 (2006): 195. arXiv:gr-qc/0409007. Bibcode:2006GrCo...12..195K. Krasnikov, Serguei (2003). "The quantum inequalities do not forbid spacetime shortcuts". Physical Review D. 67 (10): 104013. arXiv:gr-qc/0207057. Bibcode:2003PhRvD..67j4013K. doi:10.1103/PhysRevD.67.104013. Li, Li-Xin (2001). "Two Open Universes Connected by a Wormhole: Exact Solutions". Journal of Geometry and Physics. 40 (2): 154–160. arXiv:hep-th/0102143. Bibcode:2001JGP....40..154L. CiteSeerX 10.1.1.267.8664. doi:10.1016/S0393-0440(01)00028-6. Morris, Michael S.; Thorne, Kip S. & Yurtsever, Ulvi (1988). "Wormholes, Time Machines, and the Weak Energy Condition". Physical Review Letters. 61 (13): 1446–1449. Bibcode:1988PhRvL..61.1446M. doi:10.1103/PhysRevLett.61.1446. PMID 10038800. Morris, Michael S. & Thorne, Kip S. (1988). "Wormholes in spacetime and their use for interstellar travel: A tool for teaching general relativity". American Journal of Physics. 56 (5): 395–412. Bibcode:1988AmJPh..56..395M. doi:10.1119/1.15620. Nandi, Kamal K. & Zhang, Yuan-Zhong (2006). "A Quantum Constraint for the Physical Viability of Classical Traversable Lorentzian Wormholes". Journal of Nonlinear Phenomena in Complex Systems. 9 (2006): 61–67. arXiv:gr-qc/0409053. Bibcode:2004gr.qc.....9053N. Ori, Amos (2005). "A new time-machine model with compact vacuum core". Physical Review Letters. 95 (2): 021101. arXiv:gr-qc/0503077. Bibcode:2005PhRvL..95b1101O. doi:10.1103/PhysRevLett.95.021101. PMID 16090670. Roman, Thomas A. (2004). Some Thoughts on Energy Conditions and Wormholes. The Tenth Marcel Grossmann Meeting. pp. 1909–1924. arXiv:gr-qc/0409090. doi:10.1142/9789812704030_0236. ISBN 978-981-256-667-6. Teo, Edward (1998). "Rotating traversable wormholes". Physical Review D. 58 (2): 024014. arXiv:gr-qc/9803098. Bibcode:1998PhRvD..58b4014T. CiteSeerX 10.1.1.339.966. doi:10.1103/PhysRevD.58.024014. Visser, Matt (2002). "The quantum physics of chronology protection by Matt Visser". arXiv:gr-qc/0204022. An excellent and more concise review. Visser, Matt (1989). "Traversable wormholes: Some simple examples". Physical Review D. 39 (10): 3182–3184. arXiv:0809.0907. Bibcode:1989PhRvD..39.3182V. doi:10.1103/PhysRevD.39.3182. Wikimedia Commons has media related to Wormholes. What exactly is a 'wormhole'? Have wormholes been proven to exist or are they still theoretical?? answered by Richard F. Holman, William A. Hiscock and Matt Visser. White holes and Wormholes provides a very good description of Schwarzschild wormholes with graphics and animations, by Andrew J. S. Hamilton. Questions and Answers about Wormholes a comprehensive wormhole FAQ by Enrico Rodrigo. Large Hadron Collider – Theory on how the collider could create a small wormhole, possibly allowing time travel into the past.